Doha fun place to be was once there with now cheating spouse. I recently joined post crossing and found some at Carrefour and Gulf Greetings too. They also have some at a souvenir store (more like a stand) in Vilaggio. You'll find it if you walk from Starbucks towards Virgin Megastore, if I remember correctly. Aww this is cute - I used to love sending postcards.. not so much anymore. Interesting stamps you got there! Do you suspect your partner of infidelity or having an extramarital affair? I'll advice you to get proof first before confronting him/her. As that could result in unnecessary confusion in your relationship or marriage. it's always advisable to consult SPYMASTERPRO3X@ Gmail. Com a professional hacker to help you get concrete evidence by discreetly getting access to their phone or computer, worked for me a couple of times and never disappoints. Provides Accurate results and can be trusted for 100% privacy and really affordable fees. Contact [spymasterpro3x A T GMAIL d o t com] , can as well text the cell no +1717 323 2387 Very Fast and reliable. Hi, thanks for the very useful information. 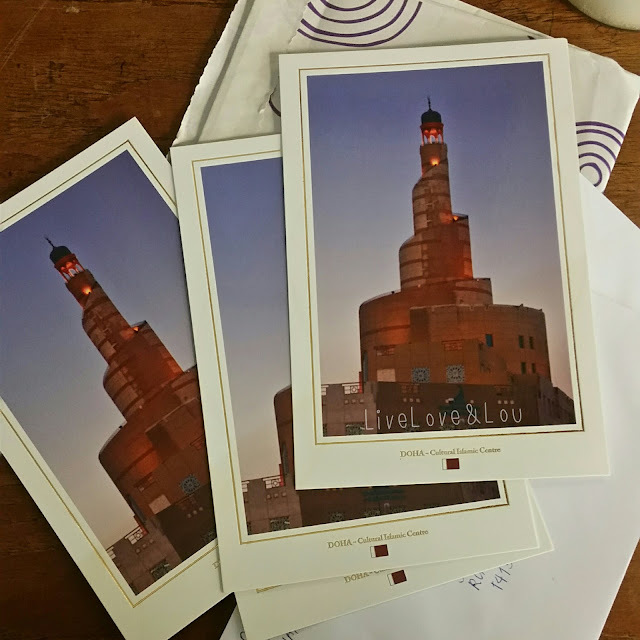 This helped me a lot to send some Postcrossing postcards from Qatar within a 10 hour stopover at Doha airport. 1. The rate for postcards is definitely 8.50 QR. You don't need an envelope, just stick the stamps on the card (as usual). I asked about it at the post office and it's no problem. And some of my cards already arrived. 2. Carrefour still has some cards but the selection is extremely limited and not very nice /interesting cards are left. I guess they are not restocking. 3. I saw several tourist shops in the Souq Waqif selling postcards, just walk around. Most of them only have very few different cards available though (one of them had just a single card many times). 4. For anyone on a stopover at Doha Airport: You can easily take bus 777 from the airport to get to the center, to Souq Waqif, the main post office and the mall with Carrefour. A 24 hour unlimited journey ticket costs 20 QR. You have to buy it from the bus driver, try to get the right change in the airport before, otherwise the bus driver might claim he has no change and try to overcharge you in foreign currency if you don't pay attention to the exchange rate. Best download offline Google Maps of Doha and mark the above spots to know where to get off the bus (or just ask the driver). 1. The rate for postcards is definitely 8.50 QR. You don't need an envelope, just stick the stamps on the card (as usual). I asked about it at the post office and it's no problem. And some of my cards already arrived, so it works. 2. Carrefour still has some cards but the selection is extremely limited and not very nice /interesting cards are left. I guess they are not restocking anymore. 3. I saw several souvenir shops in the Souq Waqif selling postcards, just walk around. Most of them only have very few different cards available though (one of them had just a single card many times). Hi! Could I buy postal stamps in the Q-Post? If not, where can I buy them? Thanks! 1. The Qatar Post main office has post cards and 8.50 stamps, and the woman working there is very friendly and helpful. As you say in your recent update, you don't have to put cards in an envelope. Just stamp and mail them. 2. There is no post office or even mailbox at the Doha airport, and no airline or airport staff will agree to mail your cards for you. So make sure you mail your cards before departure day! 3. 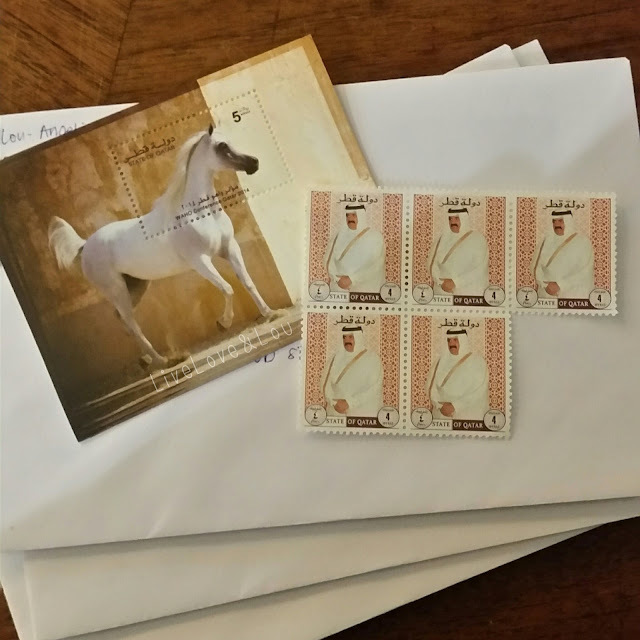 The postcards at the main post office were only 3 rials each, whereas the ones at the Museum of Islamic Art were 15 rials. The museum cards have nicer designs, but I don't know if they're worth five times more. You be the judge. I was unable to find cards at the Souq. Thanks again for your blog post, and I hope this additional information will be useful to other readers.